Atlanta Charter Bus Company books a variety of bus sizes for events of all types. Rely on us to book a shuttle service for your wedding or corporate event, transport students on an Atlanta field trip, take you to a Falcons game, or help your family tour the city’s top attractions. We’ll put together a fleet just for you for the perfect Atlanta trip! 25-passenger minibuses are perfect for medium-sized groups who do not wish to split into multiple cars. Schedule this spacious and comfortable minibus to pick up a large group from the airport, bring your family in from out of town, or take a tour of the best of Atlanta. The 20-passenger minibus is a great choice for transporting small groups into Atlanta or providing a shuttle service at a large event. Connect your event space to your hotel and let a professional do the driving; or, simply ride with your group into Atlanta without worrying about navigating unfamiliar streets. 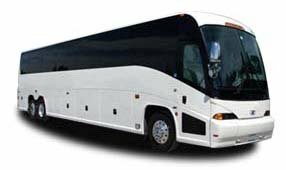 A 56-passenger charter bus is a great option for large groups traveling long distances. Enjoy spacious accommodations, plush seating, and on-board restrooms, all available upon your request. Leave the driving to a professional while you sit back and enjoy the view. Book an 18-passenger minibus for your next small group trip to Atlanta. This compact model can navigate the city’s compact streets with ease, while keeping your group together from one stop to the next. The 18-passenger minibus is perfect for small groups too large for a car.